Following the publication of articles in some of the news related websites with reference to the case of condemnation of Reyhaneh Jabbari Malayeri, the child of Faridoun, and in particular, with reference to the execution of her death sentence on the 25th of October, 2014, the information bureau of the office of the Public Prosecutor of Teheran, explains the aforementioned case of judgment as given below, for the sake of shedding light for people on the issue. Subsequent statements made by the defendant proved contrary to these claims. The place (between the shoulders) where the deceased was stabbed with the knife shows that the murder was not committed in a state of defense. The report of the examination of the corpse certifies the effects of the assault all over the body and the hands. Behind the trunk, a transverse wound eight centimeters long was seen, situated to the right side of the midsection, at a distance within two centimeters from that point, and stretching eight centimeters in to the right shoulder blade. Buying a knife with the intention of committing a murder, before the event actually took place, is suggestive of prior decision on the part of Rayhaneh Jabbari to commit such a crime. On searching the defendant’s home, a cardboard sheathing of the kitchen knife was discovered which shows that the weapon was bought by her. She has confessed to buying the kitchen knife two days prior to the actualization of the crime. Residents of the building where the crime took place stated that upon hearing the noise, they came out and saw the victim injured and bleeding. The victim came down from the fifth floor yelling “thieves! thieves!”, and when he reached the third floor he became unconscious. However, if the claim of the killer proves to be true, that she did not have any scope for running away, then the aforementioned by making some noise and clamor, could have alerted the neighbors, and with their presence could have felt a sense of security. Subsequently, during the course of the investigation, Rayhaneh Jabbari had made claims that the killing was planned by a person called Sheikhi. Likewise, the accused has also claimed that after giving a blow to the victim on his back, Sheikhi entered the house and started engaging with the victim. She says: “Sheikhi was just searching for some documents in the victim’s house, and he did not have any role in the killing.” In this context, the investigators took several measures to try to identify the concerned person, and after identifying people with similar names, and their face to face confrontations with Jabbari, finally she declared that she did not know these people, and confessed that her comments about someone named ‘Sheikhi’ was simply to misguide the investigation from taking the right course. The defendant has confessed that the knife was prepared in advance for the purpose of the murder. Likewise, the knife dealer had identified Jabbari on her direct confrontation with him. In the investigative proceedings carried out about her, the defendant’s employer and her colleagues have acknowledged about her being a liar, and have said that, on the day the murder took place, she announced that her father has bought a Toyota Camry, while in fact the car was owned by the deceased (murdered) person. They have described her as a liar who loved to project herself as someone who is greater than her real worth. 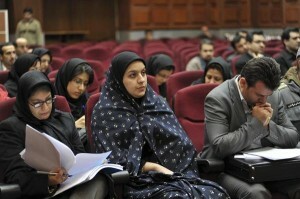 After conducting investigations through special investigative teams related to murder cases, and holding hearings on the Provincial Penal Court, the Court ultimately declared the termination of proceedings by imposing a charge of premeditated murder on Rayhaneh Jabbari, and she was sentenced to death, and the Judgments issued were confirmed by Branch 27 of the Supreme Court Judgments as well. Over the past few months, the file has been moved to the stage of execution. The killer, whose previous claims have already led to investigation of their truthfulness or falsity, and has, for a lengthy period of time, led to the diversion of the flow of files from its proper channels, has raised the matter yet again, and has put abundant efforts in pretending to be oppressed, and has raised suspicions about the truthfulness and veracity of the judgments made in her regard. For all such reasons it is required of us to announce that, all of the above claims corresponding to the case were reviewed, and the possibility of anything to be false were cross-checked and verified at various stages of the trial by the Interrogators, the Provincial Penal Court Judges ( five in number), and the Supreme Court Justices. Despite all such efforts, the prosecution put further efforts in order to reach a compromise and consent with the next of kin of the deceased, and despite holding a meeting to the same effect, involving the next of kin of the deceased, and the killer and her family, the victim’s family, ultimately, called for sentencing to death of the accused, as a result of which, the sentence was brought to enforcement during the hours of the dawn.